I had pictures of two great shooters on trail camera in September. One was a wild non-typical with a ton of mass, and the other a very typical nice wide 8-point. I knew I wanted the 8-point more than the other so I held off shots at smaller 4 and 6 pointers. I got to the old oak tree stand around two in the afternoon on November 4, 2012. After having a 4-point lay down fifteen yards behind my stand, a 6-point at twenty yards chasing does, and my dad at the other end of the woods waiting for a doe I knew something was going to happen. I heard a little sparring down in the gulley and ten minutes later a massive bodied buck stepped into the field. I knew it was him. After grunting him in, which seemed like decades he finally gave me a 35 yard shot broadside. I watched as the arrow entered the buck just an inch to far forward, catching his shoulder blade. I could see the arrow sticking far out his side as he ran away. Desperate for a drop of blood, I called all of my hunting buddies to help me track. After finding good blood and a 1/2 mile track we called it quits at 9:30pm. I tried getting off work the next morning to go look for my buck, but no luck. With only an hour and a half left to search after work I quickly changed into my camo and grabbed my bow. Searching the thick area where the blood trail lead brought no sign of a white belly. Disappointed I headed back to my stand with a half hour left to sulk in daylight. Spotting a doe in the field on my walk back I hid in a nearby hedgerow to watch her. She quickly got ran off by a little buck, I stood back up to head to my stand. All of a sudden I heard a deep, long, grunt. Quickly sitting down and nocking my last arrow I grunted back just with my voice. The buck, hidden by standing corn, quickly grunted back and I heard him thrashing in the crisp, dead corn stalks. I snort-wheezed... he answered. I knew his route would be on the down wind side of the hedgerow I was in. I looked up and there he was, the same buck I had shot the night before, ready to fight. He walked quartering to me as I kneeled on the ground in the hedgerow. I waited for him to stop and look around, but he was on a mission. For a split second he sniffed the ground in front of him and I drew my PSE Bow Madness. Quickly he looked at me, I rushed the shot and spined him, sending the 245# monster to the dirt. I rushed to dispatch of him with a knife when he came up with his G2 and caught my entire arm from wrist to armpit. Not feeling it then because of the rush of adrenaline I dispatched of him. I had finally gotten the buck. Luckily my dad was able to help me drag him out, he was a giant. After getting home I could finally feel the bruise on my arm. Man it was bad, a black and purple line running straight up it. The buck weighed 245 pounds live weight and is my biggest yet. 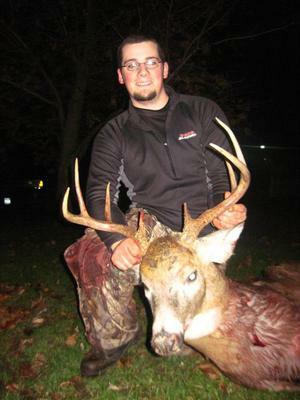 Very rewarding to have the pictures and knowing that is the buck I waited for all season.